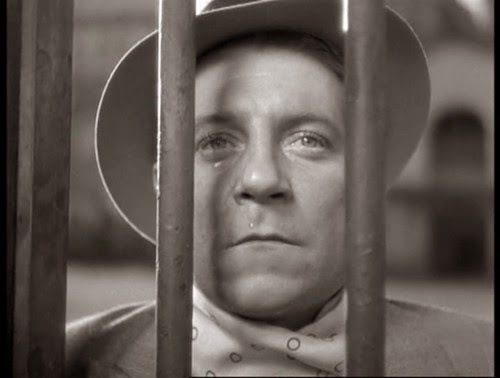 Jean Gabin as Pepe -- he'll never have Paris. This essay originally appeared in Senses of Cinema in November 2013. This famous Hollywood misquote, and the amorous adventures of the animated skunk Pépé le Pew, might seem to constitute the only lasting bit of cultural fallout from Julien Duvivier’s Pépé le Moko (1937). However, this classic film resonates in much less obvious and more far-reaching ways. It stands as the place of origin of several vital archetypes, not the least of which is Jean Gabin himself. The film’s international success prompted MGM to buy the American rights for it immediately. In keeping with studio policy of the time, the original was kept from American distributors while the US version, Algiers (1938) was cranked out less than a year later. Such is the strength and coherence of the original that Algiers director John Cromwell, in a rare and unusual move, is purported to have kept a copy of Pépé le Moko on a Moviola on the shooting stage so that the original’s setups and camera moves could be replicated as closely as possible. Ironically, this approach would garner Oscar nominations for the art director and cinematographer of Algiers. Duvivier’s original film is one of five starring Jean Gabin during 1935-37, a string of hits that established him as the number-one male star in France. La Bandera (1935), La Belle équipe and Pépé le Moko were all collaborations with Duvivier; the actor also made Les Bas-fonds (The Lower Depths, 1936) and La Grande illusion (1937) during that time with Jean Renoir. In all these movies Gabin is the epitome of the (French) common man. He’s a regular fellow, a tough guy with a touch of poetry in him. After a generation of brilliantined, toothy leading men, Gabin was “natural” – almost studiously unaffected, impertinent, slangy. This incredibly appealing persona – a man all women want to bed, and all men want to have a beer with – rapidly became as rigid as those inhabited and crafted by Spencer Tracy and Humphrey Bogart. Gabin films became a subgenre in themselves, featuring the same archetypes, plot points, and even a contractually obligatory, pivotal emotional outburst by Gabin for every finished product. No wonder François Truffaut despised him, as the emblem of a “Tradition of Quality” that Truffaut saw as a dead hand on the throttle of mainstream cinema. In Pépé le Moko, Gabin is a kind of Noble Savage: the equivalent of a robber chieftain, skilled and highly regarded, but still outside the pale of polite society. He is the King of the Casbah, but also its prisoner – he has left a string of busted banks and dead policemen after him, and will go to the death house if he is ever taken. Like Napoleon on Elba, or King Kong on Skull Island, he is extraordinary and powerful, but also circumscribed. Indeed, his end bears echoes of “Beauty and the Beast” without the redemption (1). The Casbah, with its narrow, twisting streets, multiple terraces, hidey-holes, secret passages, and trapdoors – the insularity that only a polyglot population of outcasts can provide – is impenetrable to the police (2). Pépé must be drawn out into the logical, Europeanised space, where he can be arrested. Inspector Slimane (Lucas Gridoux), a cross between Javert and Iago, baits the trap with the lovely Gaby, a Parisienne slumming in the native quarter when Pépé encounters her. But Pépé is literally circumscribed, and he is suffering from a malaise so prevalent to the French that they gave it an idiom – “avoir le canard”, a mixture of disconnectedness and self-pity found in exile. Gaby is not fascinating in and of herself, really not much more than a high-priced call girl, but she embodies everything about his beloved Paris for Pépé. He wants to turn back the clock, to walk the streets of Montmartre, to assert a freedom he no longer possesses. This dream leads him to his doom. In its bleakness, Pépé le Moko fits into the classification of 1930s French poetic realism (or is it more accurately populist melodrama?). In most of these films, a proletarian protagonist is slated for inevitable destruction – absolutely reactionary in that it typifies the struggle for positive change as hopeless. Like the other romantic heroes he played, Gabin’s Pépé will not accept the fate that keeps him down – of course, the racist correlative to this is that he refuses to share the contemptible status of a native, an outcast, or an unfortunate. He wants what he feels is his due as a white Frenchman. Unlike Milton’s Satan, Pépé doesn’t choose to reign in Hell. As he races out of the Casbah to the docks to find Gaby, his surroundings fade away and are replaced by matte shots of Montmartre. Whether labelled as childish romanticism or ego, Pépé is surely the first film character to die because he couldn’t have Paris. (Conversely, in Casablanca the ill-fated lovers are redeemed because they discover they’ll “always have Paris”.) He’d rather be Pépé le Parisien than Pépé le Moko. Duvivier’s creation spins high culture out of low. A key aspect of poetic realism is its insistence in finding beauty in the mundane, a hallmark of all of Duvivier’s films. Duvivier isn’t generally perceived as an auteur and, like Michael Curtiz and Victor Fleming, he can be regarded as a master of the Golden Age house style favoured by the major studios – “invisible” editing, tricky but unobtrusive camera movement, and an obsession with lighting and extracting the values of the human face. For all its air of gritty realism, Pépé le Moko is a highly controlled, stylised production. After the story’s construction, colloquial expert Henri Jeanson worked up the hardboiled dialogue. Duvivier did almost all of his principal photography in the studio, creating extensive set work that allowed much more precise lighting. Marc Fossard and Jules Krüger’s cinematography is meticulous and worthy of the Oscar notice its imitation stirred. It illuminates the mise en scène created by art director Jacques Krauss with genuine interest and inventiveness. All of these elements would migrate into French and American film noir especially as the aesthetics of black-and-white began to reemerge in contrast to the conservative, evenly lit colour film palettes of the time. Instead of heroic deaths, though, the generations of noir protagonists to follow were suckers, playthings of dark forces, who frequently wound up dead for no reason at all. This unique intersection of talent, mood and theme gives us a perfectly pitched movie; enjoyable simply as an adventure in itself, with fascinating overtones for those whose vision goes deeper (3). 1. There is a cornucopia of derivations of the nickname “Moko” in film, few complimentary. It’s instructive to note that the name of the villainous drug lord in Robert Rodriguez’s 1992 feature debut El Mariachi is Moco – Spanish for booger. 2. The idea of it being an organic, anti-linear, female space is explored, along with much else, far more completely and eloquently in Ginette Vincendeau’s invaluable book-length examination of the film, Pépé le Moko, BFI, London, 1998. 3. The following sources were also consulted in the preparation of this article: Colleen Kennedy-Karpat, Rogues, Romance, and Exoticism in French Cinema of the 1930s, Farleigh Dickinson University Press, Madison/Teaneck, 2013; Michael F. O’Riley, Cinema in an Age of Terror: North Africa, Victimization, and Colonial History, University of Nebraska Press, Lincoln and London, 2010; David Henry Slavin, Colonial Cinema and Imperial France, 1919-1939: White Blind Spots, Male Fantasies, Settler Myths, The Johns Hopkins University Press, Baltimore and London, 2001; Ginette Vincendeau, The Companion to French Cinema, BFI, London, 1996; Ginette Vincendeau, Stars and Stardom in French Cinema, Continuum, London, 2000.
Review: Patton Oswalt's "Silver Screen Fiend"